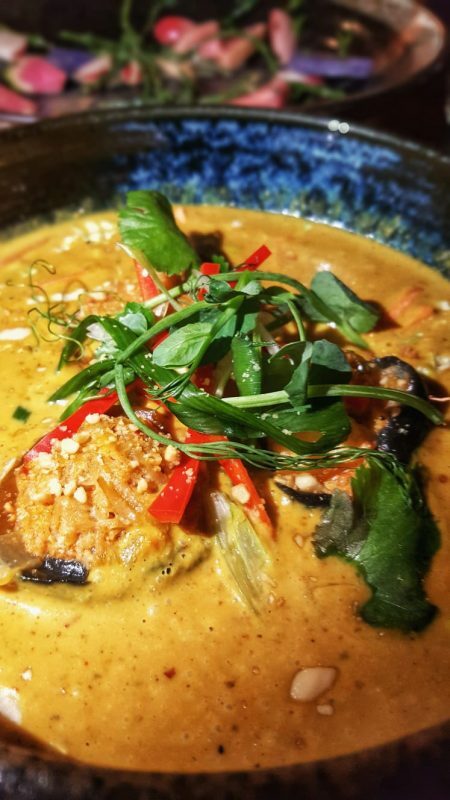 Sitting in the heart of Soho is Gamma Gamma serving up Asian inspired dishes, tapas style. 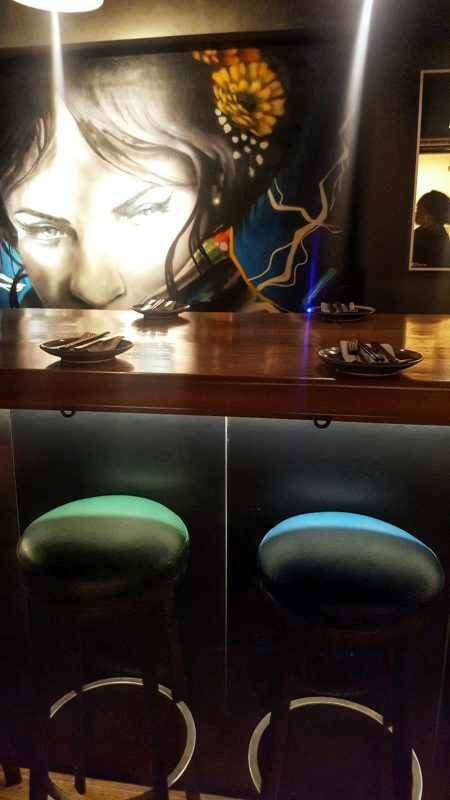 The interior is stylish and dimly lit with a long bar taking up the centre space for quick dining and colourful art splashed across the walls. We started with a Pink lady (£11) Russian standard, lychee liqueur, almond syrup, aloe vera juice, yuzu syrup, raspberry. 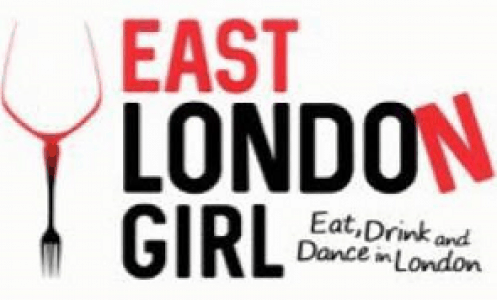 We then chose gin based E.c.g. (English county garden) £11, with rosemary infused gin, prosecco, acai, elder flower cordial, peach bitters. 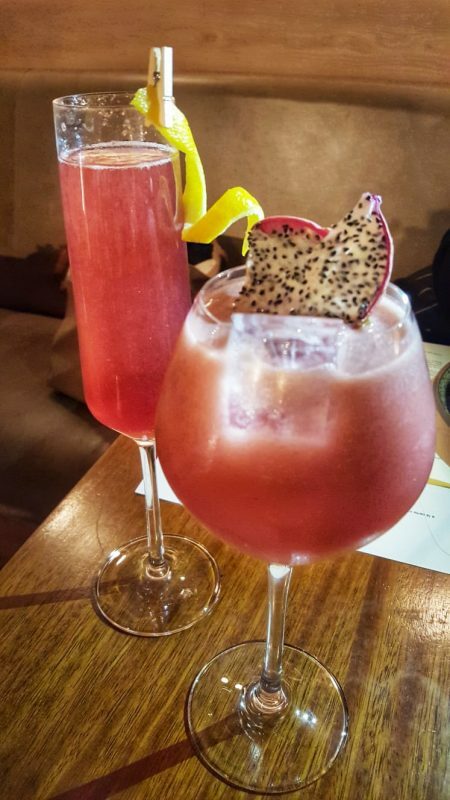 Both cocktails had sharp presentation, nothing too OTT, pink in colour with a lemon twist and some dragon fruit set them off nicely. The flavours were spot on for both. The Pink Lady was tangy and fruity and the E.v.g was refreshing and reminiscent of spring. This pan asian restaurant in London is inspired by tapas plates for sharing. The menu is handily split into meat/seafood/veg sections for ease of ordering according to your preferences. As advised, we ordered 6 dishes to share for 2 people. First to be served were the Steamed cheung fun(£8.90). 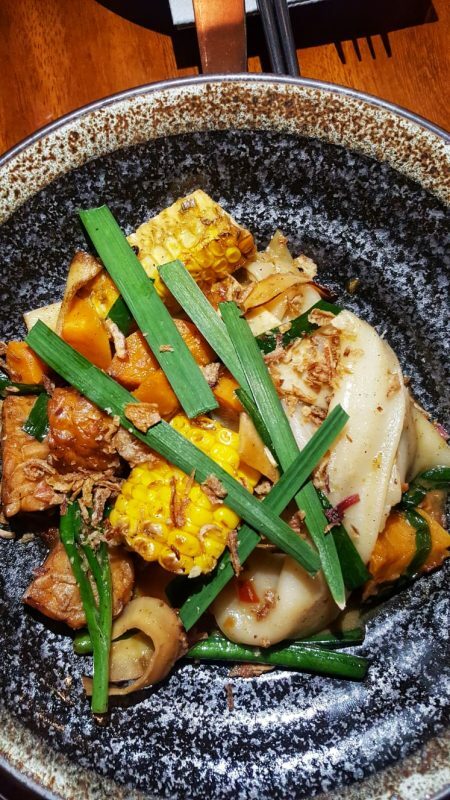 This was chinese style handkerchief rice noodles, tempeh, sweetcorn, kabucha pumpkin, king oyster mushroom, coconut-ancho chile palapa sauce. The silky noodles and a great flavoured sauce made this a lovely veggie option. 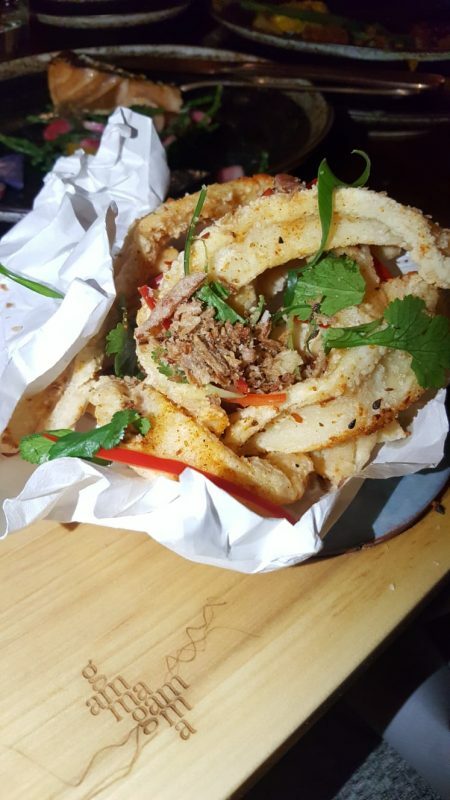 Next we had perfectly fried crispy calamari with yuzu mayo (£5.50)which was lovely and tangy. Our favourite dishes of the night by far were the Cornish crab dumplings (£9.90) in laksa broth, cashew nut brittle and Soy glazed hot smoked salmon (£8.90) with samphire, jicama, purple potato, radish, kalamansi vinaigrette. The former consisted of 3 generous meaty dumplings in the most flavoursome and rich broth. The broth could be eaten alone by the spoonful, it was an absolute delight. The soy glazed salmon was gorgeously smokey and served with beautifully coloured veg with great bite. We also had a side of delicious rosemary, garlic, miso & parmesan coated sweet potato chips (£4.90) that also hit the spot. Our final dish was the quinoa topik (£6.90), a chickpea & potato fritter with curried aubergine, date molasses. This was a comforting dish to finish on with great texture and the sweetness of the molasses was lovely. Despite the 6 plates being more than filling, having experienced the wonderful mains, dessert was a must. Scanning the menu revealed traditional dishes (panna cotta, fondant, eton mess) with Gamma Gamma signature twists of flavours and ingredients. We opted for the black sesame fondant (£9.90) and peanut butter & hazelnut parfait (£7.90). The fondant was perfectly cooked and served with fabulous accompaniments of white chocolate and matcha green tea ganache, miso toffee sauce, roasted black figs and greek yogurt and miso ice cream to dip into. 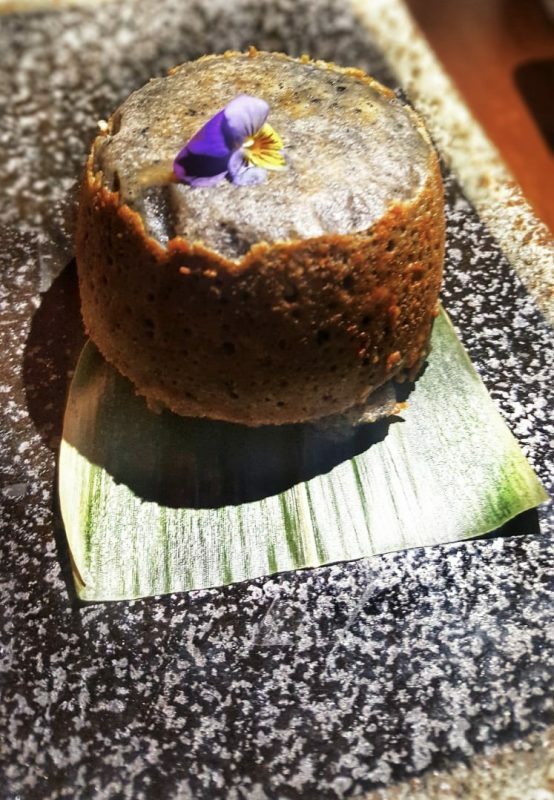 The black sesame meant the fondant was not overly rich or sweet. The parfait oozed of peanut butter flavour and was served with a rich and silky kahlua & dark chocolate delice, chocolate crumbs and peanut brittle that had wonderful crunch. Both desserts were a triumph and the mix of textures and flavour that left us seriously impressed. Gamma Gamma is an excellent pan asian restaurant in London. There is a true mix of flavours, cuisines and colour offered in the dishes – real fusion in every sense. The dishes, whilst consisting of some familiar flavour profiles had elements of surprise, beautiful presentation and incredible richness of flavour. 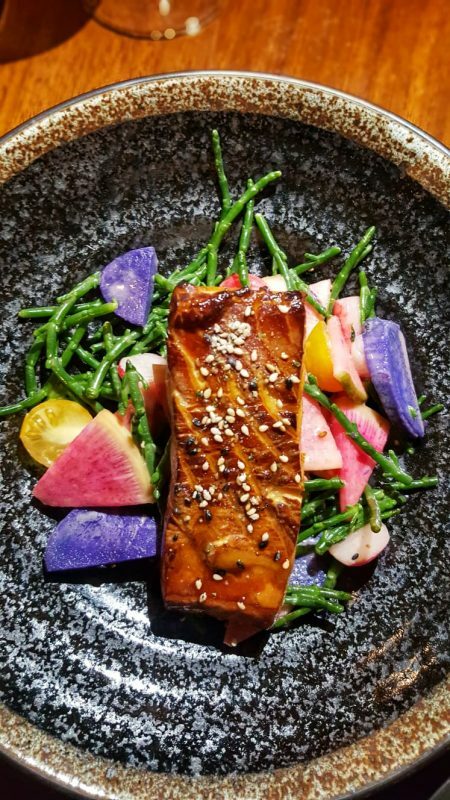 You may write off Asian fusion for having being done by so many restaurants, but the chefs at Gamma Gamma have created fresh new ideas that really sing with flavour and excitement With such a central location it makes it perfectly easy to pop to. We would highly recommend it for high quality plates you will not forget in a hurry. They have tasting menus of 6 or 9 dishes and offer an exciting looking brunch offering too.